During Graduate Fashion Week, Micro Macro had the pleasure of meeting a few talented knitwear designers graduating from Nottingham Trent University. 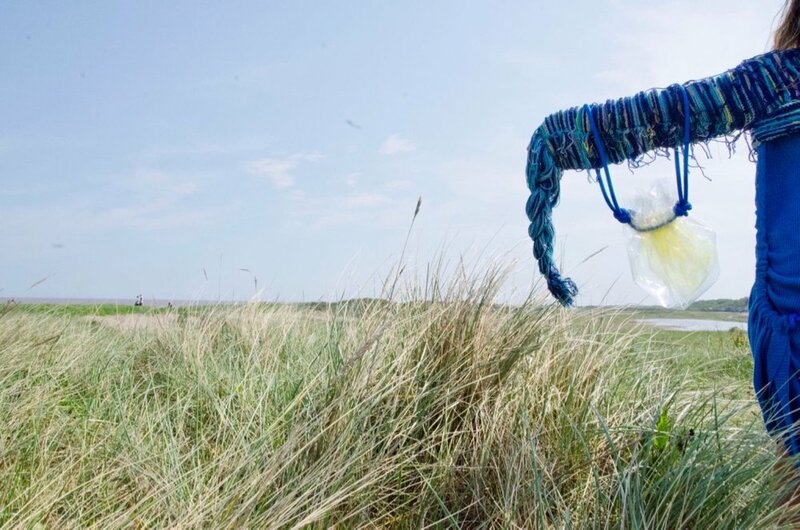 We've talked with four stand-out knitwear designers to keep on eye on as they graduate university and head out into the world of fashion. Rachel Coppard, who recently received her divers license used the ocean as her inspiration. Bringing awareness to the impact humans have on the ocean. Rachel uses plastic strategically in her design to exemplify plastic as a restriction to beauty. The plastic suffocates while the natural materials, beautifully and intricately made, are struggling to breath. Rachel kept movement in mind as she designed the collection wanting to reflect the ocean and it's inhabitants in her garments while using the rigidity of the plastic to constrain the natural movement of the knitted fabric. Overall Rachel's designs are visually stunning, with a social message that is artfully subtle in execution, but poignant and impactful in understanding. You can find more of Rachel's work here. 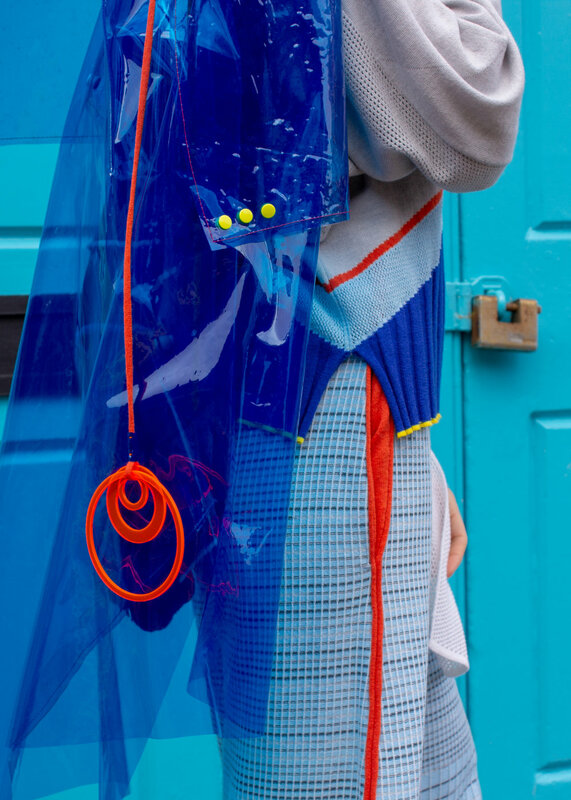 Harriet Meakin would sum up the feeling of her collection to be 'bright, energetic and dynamic.' I would have to agree. Her inspiration for the collection started during her placement year in Hong Kong. She was especially impacted by the buildings, she abstracted shapes she found in her own photography during that time to use in her collection. With a fascinating design approach Harriet enjoys translating product design into fashion as a part of her process. You can find more of Harriet's work here. Centered around the 1980s party era, Jessica Boyle uses bright colours and nostalgic silhouettes for this collection. She also used her mother as inspiration. Because her mother as a young ambitious hard working woman in the eighties Jessica hoped that inspiration would resonate with the young ambitious women of today. By using family photos and samples of her mothers actual clothes from the eighties, this project became much closer and personal for Jessica. She exhibits her love for brightly coloured beadwork in the details in the three looks. The intricate beading gives the collection a fun and celebratory air, which compliments the party aspect of this collection. You can find more of Jessica's work here. Chloe Thurlow's collection entitled in Sacred Girl's Club was inspired by the impact childhood bedrooms have on a girl's identity. She plays on the concept of how a childhood room is almost like a shrine to their development. Chloe starts her process by collaging first and then creating the patterned fabrics that she'll use in her design. For this collection she used a variety of knitting machines, in addition to knitting and embroidering by hand. Her collection has a retro feel and she wanted the materials used to reflect that. The accessorized knit "toys" were a really wonderful stylistic addition to the collection. You can find more of Chloe's work here.